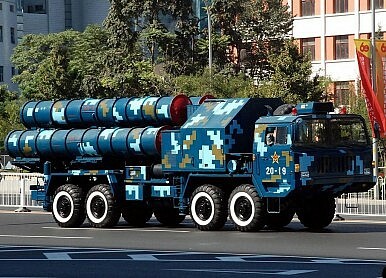 An HQ-9 missile launcher on display during a Chinese military parade in 2009. Close on the heels of a U.S. freedom of navigation operation near a Chinese-held feature in the Paracel Island group, China has deployed surface-to-air missiles (SAMs) to the area. Fox News first reported the missile deployment, based on analysis of satellite imagery; the news has since been confirmed by both the U.S. Department of Defense and Taiwan’s Ministry of National Defense (MND). Using imagery from ImageSat International, Fox News reported that China had deployed two batteries of SAMs and a radar system on Woody Island, the largest of the Paracels. The missiles were deployed on the beach sometime between February 3 and February 14 (the latest U.S. FONOP, which passed within 12 nautical miles of Triton Island, was conducted on January 30). A U.S. official told Fox News that the deployment appeared to be China’s HQ-9 (Hongqi-9) missile defense system, which has a range of 200 kilometers (just under 125 miles). HQ-9 can be used to intercept both aircraft and incoming missiles. A spokesperson from Taiwan’s MND, Luo Shou-he, said that Taiwan was aware of the deployments and would be watching further developments closely. Taiwan, along with Vietnam, also claims the Paracels Islands, which are currently controlled by China. Luo urged all parties involved in the South China Sea disputes to work together toward peace and stability, and to avoid taking unilateral actions that raise tensions. China has occupied Woody Island (known as Yongxing Island in Chinese) since 1956 and houses a population of around 1,000; China began stationing troops on the island in 2012. The island hosts an airport with a 2,920 meter runway (thanks to expansion and construction in 2015) and an artificial harbor. In recent days, China has grown more vocal about its defense moves in the South China Sea, a slight shift from a previous strategy that emphasized the civilian and international benefits of Chinese construction in the disputed region. On Tuesday, Foreign Ministry spokesperson Hong Lei told reporters that, while China’s construction efforts were “mainly” about providing “maritime public service,” China will also “deploy necessary national defense facilities on the islands.” Doing so “is an exercise of self-preservation and defense, a right granted by international law to sovereign states,” Hong added. “This is completely different from ‘militarization,’” Hong said. U.S. military officials have previously warned that China could deploy missiles and radar to islands in the South China Sea, which it could use to enforce an air defense identification zone (ADIZ) in the area. Missile and radar deployments would allow China “to exert basically greater influence over what’s now a contested area,” Admiral Samuel Locklear, then the commander of U.S. Pacific Command, told Congress last year.